Join us for #WalgreensBeauty Twitter Chat 8/13! This post has been compensated by Collective Bias Inc and its advertiser. Do you love a good Twitter Party? You know we do and we’re excited to host a party about must have summer beauty products! 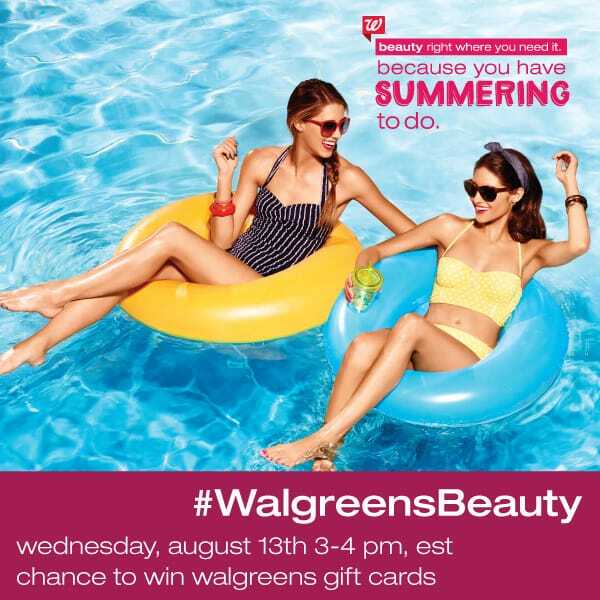 On August 132014 at 3:00pm ET, please join us for the #WalgreensBeauty Twitter Party where we’ll be discussing go-to looks and summer trends, and giving you a chance to win prizes! I’m sure your summer beauty routine is pretty different from other seasons, right? When it’s hot and humid outside, I tend to use more lightweight products, curling my hair more often (ahh frizz), and wearing brighter colors on my nails. What about you? Come chat with us during the Twitter Party for makeup tips, makeup tutorials, and details about a sweet freebie with purchase going on at Walgreens! Join me and RSVP for the #WalgreensBeauty Twitter Party on SoFabChats! TIP: Where to find Twitter Parties? Check out the SoFabChatsTwitter Party Calendar to find more fun parties to attend!